I Am Mike D: Football is Boring. As the Mariners' two-week plunge into mediocrity continues, as some of baseball's best teams arrive in town to pad their stats on a team in full wilt, and as football season promises to steal away attention like a soap opera siren, that anger is getting replaced with another "A" word. "Fans feel like the guys that have been making decisions are not making good ones. This is bordering on the verge of no interest. When the NFL season starts, (the Mariners) will be all-but-forgotten." Not to Eric Draluck. At least not entirely. Football is boring, said the devoted, despondent Mariners fan. "I'm always going to watch baseball," he said. "I'm a baseball guy. But I'm disappointed as everyone must be." Percentage of time that the ball wasn't in play: 94. Percentage of time my cerebrum wasn't in play: 94. Football is boring? REALLY. I doubt you will ever see THIS as a promotion at a football game. C'mon! 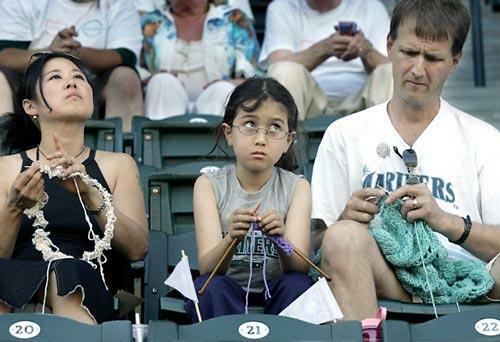 Knitting at a game, and he calls football boring? Beano Cook said it best when the then commissioner of baseball, Bowie Kuhn gave the returning Iran hostages lifetime passes to major league parks, "Haven't they suffered enough?" Interviewer: 'So Beano, who's your MVP in baseball this year? LOL!!! Tonight on ESPN Classic they had 'Who's #1' with the topic being 'top 20 biggest upsets in College Football history' Lots of Beano Cook in there. 'In 1950, Navy was just....not that good' LOL!